Summer is the perfect time to try out some new hairstyles, so if you're feeling like you're stuck in a hair do' rut and fancy a temporary change, take a look at these three KMS California helpers. One of my favourite summer hairstyles has to be the ever-popular casual beachy waves look. It looks great on shoulder-to-longer lengths and is super easy to achieve (which is probably why it appeals to me so much!). Usually I'd recommend salt sprays if you want this kind of look, but if you have dry hair like mine, they can dry it out even more. HairPlay Dry Wax is a surprisingly good alternative to salt sprays as it gives lots of texture, some volume and root lift, plus a light hold, but without any of the dryness or stickiness. Just spritz onto towel dried hair and then blow dry in sections depending on what kind of textured style you want to achieve. Easy! If it's big hair that you're after, then this one will quickly become your new BFF. AddVolume does just that and more. It delivers volume and fullness where you need and want it, adds a healthy looking shine as it also doubles up as a protective leave-in conditioner, and it detangles unruly hair to make it more manageable. To use, I spritz all over towel dried hair and then comb it through so that everything's covered. Afterwards I'll dry and style it as usual and my hair will look and feel bouncier, bigger and virtually frizz-free. I haven't used any styling gels since I was in college and had short hair, so I was a little hesitant to try this out. Most of the time when I think of gels, I think of sticky, slimy, hardening concoctions, but HairStay has managed to change my mind. Firstly, the formula of this styling gel is more like a thick serum in texture, and once applied to the hair, it doesn't feel sticky, go crunchy or flake everywhere. It's definitely a less is more product and I've used it successfully for when I want a slicked-back ponytail as it firmly holds in place all of my little baby hairs at the front. If you're a fan of this season's 'wet' look, you'll simply love this. 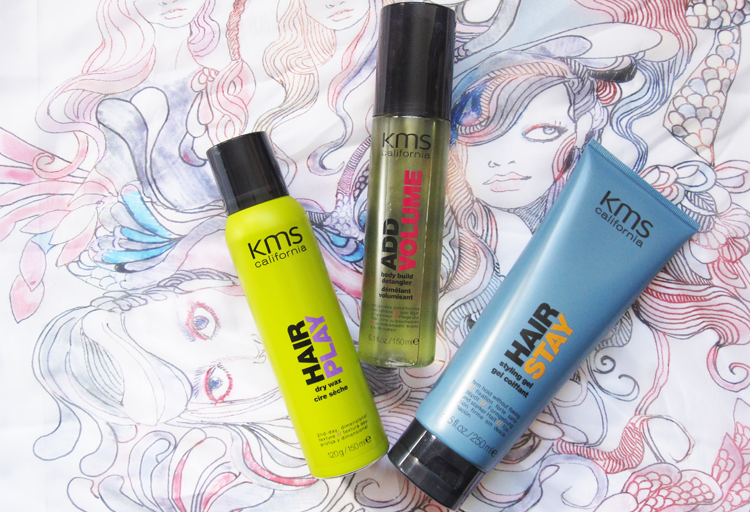 Have you tried / do you use any hair styling products from KMS California? P.S Have you entered my giveaway to win a personalised Baker Days Letterbox Cake? Enter here! I've never used any of these KMS products before. But your review sounds lovely! I have used their sea salt spray and absolutely loved it, so maybe I'll have to pick up one of these next time im at the salon! I'll have to give that one a try!